S DigitalOcean.com – cloud hosting, built for champions: sign up and receive $10 in hosting credit immediately! Q: Which market opportunity are you addressing with your Virtual Services? A: The market opportunity is end-user services for Service Providers. That means giving efficient and cost-effective ways by which Service Providers can offer their customer base services such as Parental Control, Anti-Virus, IoT Protection, Wi-Fi Diagnostics and many more. It is an enormous market (we have market analyses that estimate it around $221B) and the natural path for SP’s wishing to offer their customers the next level of value, increasing their own ARPU and decreasing churn at the same time. And through it all, improving the customer experience. Q: How are Service Providers addressing that today? A: The idea of offering services is not new to SP’s. Some provide commercial bundles (buy our Internet and get discount on anti-virus for your computer), but more and more we see the SP’s looking at using the home router (modem or gateway) as a platform on which to integrate these services. And I think this trend makes a lot of sense: routers are ubiquitous, they’re always on, SP’s already know how to manage them and – quite uniquely – they see all traffic going in to or out from out homes. Some services (like IoT Protection) need that sort of visibility. Q: So how will Virtual Services help them? If providers are already providing services, why do they need you? A: In lots of ways. Integrating services on routers is a nightmare process. Software integration is a huge effort (we’ve done it several ties in the past for various customers) and the resulting testing and field upgrades are slow, protracted processes. And you are continually battling free memory budgets. So even if you can squeeze in a service, you’re usually pretty much stuck after that. Multiply that whole effort by the number of versions of routers you need to support and the number of vendors you’re working with and you have a model that will not scale. It’s not sustainable. Our approach is different – use the routers but avoid their problems. It really is the way of combining the best of both worlds: freeing the routers of their shackles, so to speak. We provide a platform (we call it our Virtual Service Launcher) running at a data-center and deploy the 3rd party services on top of that. 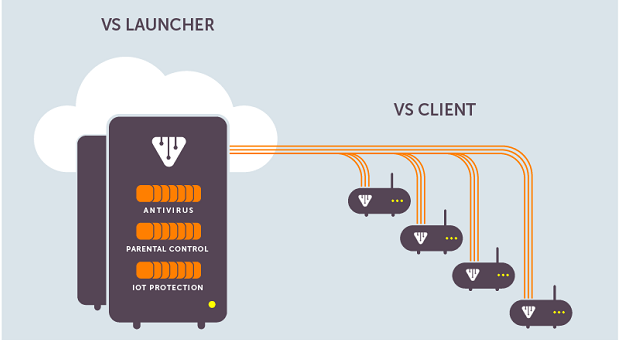 The Launcher acts as a virtual extension to the home router, so an Anti-Virus service running on our Launcher really does “think” that it is running inside the router. Same functionality, same opportunity. Just no software integration, no memory constraints and no field upgrades. And since our client (the Virtual Services Client) is tiny – it’s less than 500KB flash and needs just over 1MB RAM – it will fit in to even legacy or low-cost routers with minimal on-board memory. This means the SP can offer the same services to the entire customer base. So once our client is integrated, an SP can add more and more services to his portfolio without ever having to touch the routers again. There is not a single other product I am aware of for which that statement is true. Q: What types of services are being (now or soon) over your Launcher platform? A: We are working on integrating the “regulars”: security-related services such as Anti-Virus, Parental Control, IoT Protection, Wi-Fi Diagnostics and are looking at infra-structural services such as Multi-cast ABR. Longer term we have lots ideas for more. With a true platform approach we are offering, the sky really is the limit. But it’s not only the types of services we can offer: an SP can offer his customers a choice of products and let him choose. We call it a “supermarket of services”. Q: Can you tell us a little of how Virtual Services works? A: Sure. The Launcher, based at the data center, is based on an ONOS SDN controller for which we have developed several special plug-ins. That gives us a lot of functionality and stability that we can leverage from a huge base of existing user. We combine that with a set of subsystems (micro-services) that we connect over a message-passing bus and use a ZUUL API gateway to interface with the 3rd party services. It is a system designed for growth, flexibility and robustness. The Launcher communicates with our Client over two logical lines of communication: one line for controlling traffic (using OpenFlow) and one for the controlling the router system (using a remote system call library we have developed). I might add that all control is encrypted and secure. We use standard and widely-used procedures for that. Note we are not virtualizing the entire network or the CPE. In fact we are agnostic as to how they work: if your router is doing NAT, DHCP, QoS and so on, it will continue to do so with our Virtual Services. The only packets routed up to our platform are those packets needed/requested by the services running there. We don’t like to tell SP’s operating networks of millions of subscribers that they need to fundamentally change the way their networks operate. The motto is “Benefits are revolutionary, but the changes are evolutionary”. Q: How does your offering compare to the new TR-369 standard (Universal Services Platform) or open initiatives like OpenSync? A: We sometimes have a small number of terms (“services” is a great example) that we use to describe a broad range of things. So what sounds similar may be in fact quite different. I think that is partly the case here. TR-369 is a management protocol for IoT devices. I don’t believe anyone will use it to do Parental Control, nor that it is intended to do that. OpenSync is a little closer to what we are doing but let’s look at some differences. FIrst, our client is much smaller and will fit in to many places their’s won’t go (they need 6MB flash and I’ve seen number of 30-50-100MB RAM). OpenSync uses in part MQTT, which means that for new services, it will often be necessary to add code to the router. That is something we have taken great pains to avoid. But more fundamentally, much of our value is in the Launcher platform that gives 3rd party services a router-like operating environment. We can usually integrate services without even changing them, which is a big deal to our service partners. They can benefit from functionality in our platform and share it with other services. So we see companies that use and promote OpenSync like Plume as potential partners, that could benefit by integration with our platform, rather than a competitive offering. Q: Can you tell us a little about Inango? A: Sure. We were founded in 2010 in Israel. Today we employ about 60 people, with offices in Israel, Eastern Europe, Brussels and Toronoto. We are self-funded and have grown by working hard from day 1. We still provide sub-contract services to several huge companies – apart from the cash that generates, it is an excellent way for us to stay close to the world market-leaders, which is something we have been doing since our inception. We have just recently announced our Virtual Services product and, to be honest, are swamped with interest. Our biggest challenge has been convincing people that the thing really does what we say: more than once people have told us that “it sounds too good to be true”. Well it does work, and we can demonstrate it. It’s an extremely exciting period for us!